The IDx-DR system uses images of a patient's eyes to screen for diabetic retinopathy. For the first time, a computer can diagnose patients without a doctor's interpretation. In April 2018, the Food and Drug Administration approved IDx-DR, a tool driven by artificial intelligence that detects diabetic retinopathy by studying images of the back of the eye. Within one minute, the software produces a diagnostic result, detecting either the presence or absence of the condition, caused when high blood sugar damages blood vessels in the retina, which can lead to vision loss. 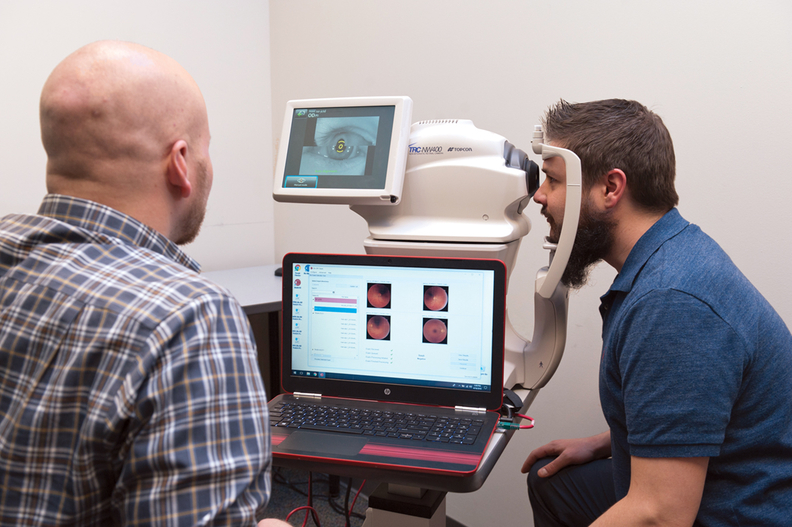 To use the tool, a provider captures images of a patient's retina and then uploads them to the software. After determining that the images are of sufficient quality, the software applies deep learning and other detection techniques to identify the presence or absence of diabetic retinopathy. If the software finds the condition, a provider would then refer the patient to an ophthalmologist. Because IDx-DR works on its own, providers who don't specialize in eyes can rely on the so-called “autonomous AI” system, which could make a big difference in advancing early treatment of retinopathy, since about half of people with diabetes do not see an eye doctor annually. Although the FDA approval process only took 85 days, the work was eight years in the making. “The biggest challenge we had is that no one had ever approved a system that makes a diagnosis without a human presence,” said Dr. Michael Abramoff, president and founder of Coralville, Iowa-based IDx. Because the FDA designated IDx-DR as a “breakthrough device,” the agency provided feedback and guidance throughout clinical trials. In the clinical study, which involved images from 900 patients at 10 primary-care sites, IDx-DR correctly detected diabetic retinopathy that was more than mild 87.4% of the time and correctly detected the lack of the condition 89.5% of the time. Since receiving approval, IDx has been ramping up implementations, drawing on a recent $33 million round of financing, led by venture-capital firm 8VC, to speed up market adoption. The company is working with academic medical centers, retail clinics and primary-care clinics nationwide to bring the system online. The company operates on a pay-per-click model: Providers bill insurers for the service, get reimbursed, and then share part of the reimbursement with IDx. Though company officials didn't offer other details about reimbursement, Abramoff said he and his team have recommended specific models to their clients. The system is live at one site already, the University of Iowa Hospitals and Clinics in Iowa City. Among the challenges of bringing the platform online is integrating it with the electronic health record. To connect the system to the EHR at the University of Iowa, the company worked with the hospital, relying on HL7 interfacing. The company can also use application programming interface integration. Now, when a person with diabetes comes in and gets imaged, the images go directly into the IDx-DR system, which nearly immediately produces a result that gets put into the EHR.